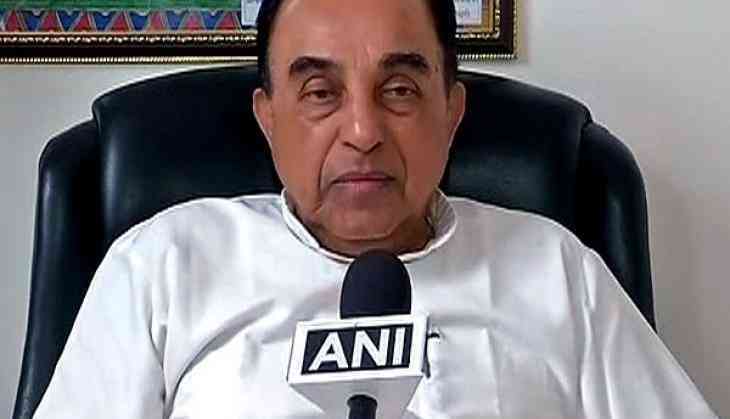 Bharatiya Janata Party (BJP) leader Subramanian Swamy on 29 April, took a dig at the Congress over their allegation that Bharatiya Janata Party (BJP) party leaked the Dhingra Commission report, saying that the latter must guilty otherwise would have demanded to make the report public themselves. Swamy told ANI, "There is nothing criminal as it is a public matter. So, therefore the Congress party must be feeling guilty, otherwise they would have demanded to make the report public." "We should see the facts in the report rather seeing that is it a leak or not. We have created the whistle blower act to unearth these kind of facts," he added. Earlier, Congress spokesperson Abhishek Manu Singhvi had asserted that Vadra had not received any notice or summons from the Dhingra Commission. "It is contempt of court if you publish the content of Dhingra report," Singhvi added. Congress chief Sonia Gandhi's son-in-law Robert Vadra on Saturday responded to Dhingra Commission report allegations that he been amassed through Faridabad land deals, saying "truth shall prevail"
Vadra took to Facebook and simply wrote, "truth shall prevail." According to reports, Vadra made unlawful profits of Rs. 50.5 crore from a land deal in Haryana in 2008, concluded Justice S.N. Dhingra. The Dhingra Commission, set up in 2015 by the Manohar Lal Government, was looking into the grant of licenses for change in land in Gurgaon. Robert Vadra's company, Skylight Hospitality, was also under the scanner. On Friday, the Bharatiya Janata Pradesh (BJP) asserted that the grand old party was looting India. "Probably, the Gandhi family considers the whole of this country as their property and were trying to loot this country. That's the reason as to why they have lost the political land," BJP spokesperson Sambit Patra told ANI. "We have seen the case of Sky light hospitality, a company of Robert Vadra which had been amassed through wrong land deals in Haryana. The case is also going on. Now we have to come to know about land deals of Priyanka Gandhi. She had also been profiting from land deals," he added. However, Priyanka Gandhi rebuffed any relation between the property she purchased in Haryana with alleged illegal acquired funds and her husband Robert Vadra 's finances or Skylight Hospitality. "Six years prior to the purported 'land deal involving Skylight Hospitality' on April 28, 2006, Smt. Priyanka Gandhi Vadra purchased 40 Kanal 00 Marla (= 5.0 acres) of agricultural land in Village Amipur, Tehsil Faridabad, District Faridabad in Haryana," a press release from Priyanka's office stated. It further said that the land was purchased for a total purchase price of Rs. 15,00,000 paid for entirely by cheque, which is the equivalent of Rs. 3,00,000 per acre.